Read my reviews of issue #1 here, issue #2 here, and issue #3 here! Spoilers for the prior comics (but not this one) are present in this review. 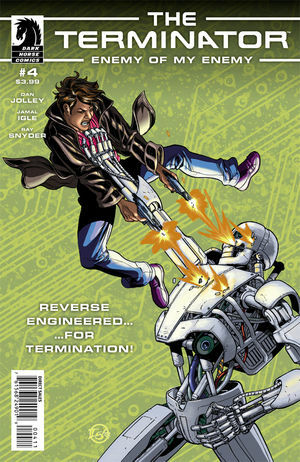 Terminator: Enemy of My Enemy #4 sees Farrow and the Terminator teaming up to rescue Elise from the clutches of the creepy mercenary group that kidnapped her. It opens with the most awkward car ride ever, which I loved, and I’m curious about how their relationship will unfold. I still find it weird that the Terminator, supposedly a T-800, looks nothing like Arnold Schwarzenegger, but maybe Cyberdyne is making tweaks in the mode; I’m not 100% sure where this falls in the movie timeline. The artwork is otherwise comparable to the other issues, with some fun panels (especially on page ten, which made me giggle, and thirteen, which is badass). The action scenes in this series have been quite good, with lots of movement and noise conveyed well (KRASHH). If you’re looking for a deep plot, look elsewhere, but if you wanna see a lot of stuff blow up, you’re in the right spot. This issue ends on a terrible cliffhanger! There are two comics left in this mini-series, and I can’t wait until they’re released! I’m liking this series a lot more than I thought I would at the beginning, when I was totally lost. 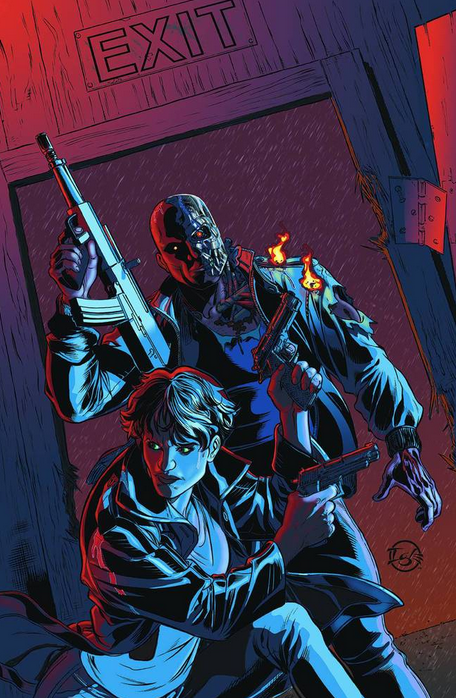 Get it from Dark Horse Comics or your local comic book shop for $3.99. The comic was released on July 9, 2014.